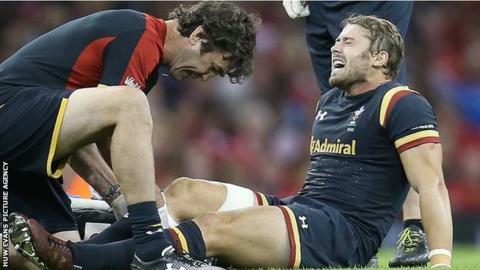 Wales full-back Leigh Halfpenny is out of the Rugby World Cup. Toulon's Halfpenny, 26, ruptured anterior cruciate knee ligaments during Wales' 23-19 win over Italy at the Millennium Stadium on Saturday. Scrum-half Rhys Webb, also 26, suffered an ankle injury in the match, but there is no news yet on the extent of the damage. The other two full-backs in Wales' 31-man squad - Bristol's Matthew Morgan and Dragons' Hallam Amos - have six caps between them. Halfpenny has scored 508 points in 62 appearances for Wales. The Welsh Rugby Union has not said who will replace Halfpenny. Wales start their World Cup campaign against Uruguay in Cardiff on 20 September, before playing co-hosts England, Fiji and Australia their remaining Pool A matches. Should Halfpenny have played against Italy? Former Wales Shane Williams has questioned coach Warren Gatland's decision to select Halfpenny against Italy. Halfpenny started the game with strapping on his right leg, suggesting he was already carrying an injury. Record Wales try-scorer Williams said the victory over Italy was "just horrendous for Wales". "Webb has been the form player for Wales and to lose Halfpenny as well, it's just a massive blow," he said. "You kind of thought 'do we need Halfpenny on the field? Let's wrap him up in cotton wool and roll him out when we really need him'. "Wales is in mourning already. Especially with Halfpenny, he was strapped up on his leg anyway." Scrum-halves: Gareth Davies (Scarlets), Rhys Webb (Ospreys), Lloyd Williams (Cardiff Blues).